Cholla Needles Arts & Literary Library: April 14! Open Poetry Reading - You Are The Featured Poet! April 14! Open Poetry Reading - You Are The Featured Poet! 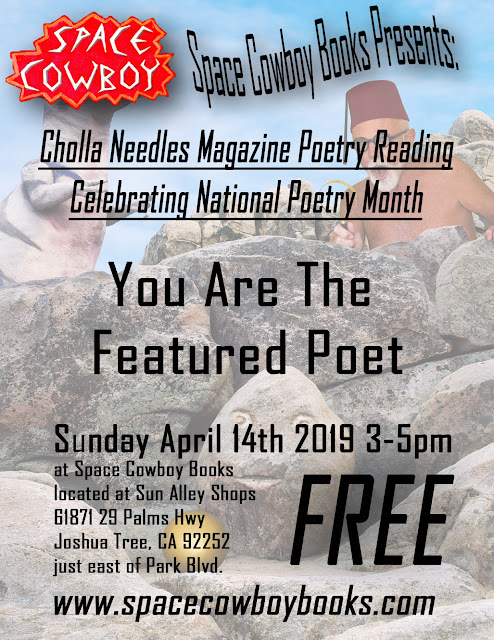 We are releasing the 28th issue of Cholla Needles! On April 14, from 3-5 PM at Space Cowboy Books, YOU will be our featured reader. We are celebrating the arrival of issue 28 with all the local poets who appear in the issue, and any member of the community who wishes to be part of this celebration of National Poetry Month. Bring a poem with you and let's celebrate our love of poetry of all kinds as a community! See you at Space Cowboy Books. We all look forward to hearing your work!